The last event to happen in a Sprint is the Sprint Retrospective. The cadence is set as per the Sprint. It happens just after the Sprint Review and before the next Sprint Planning event. 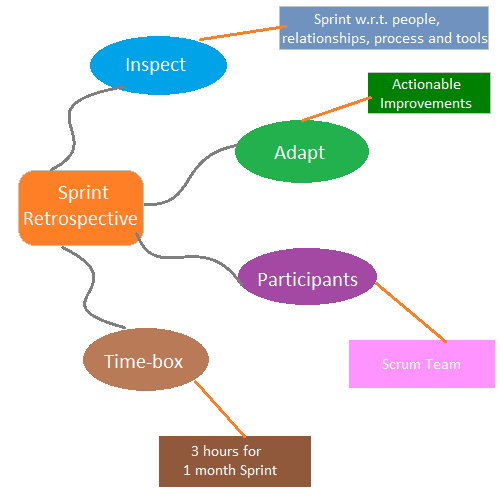 The Sprint Retrospective that follows the Sprint Review is an event for the Scrum team to Inspect and Adapt their process, their ways of working. A formal opportunity provided by Scrum for the Scrum Team to look back and identify ways to improve; so that upcoming Sprint becomes even more engaging to deliver products of highest value. As any other event, Sprint Retrospective is a time-boxed event. The time-box for Sprint Retrospective is 3 hours for one month Sprint. At it, the Scrum Team collaborates to inspect how the previous went by w.r.t people, tools, relationships and process. The Scrum Team identifies what things went well during the Sprint; what challenges were encountered and what are the areas of improvement for the team. The Scrum Team also identifies “actionable improvements” and plan to implement them during the upcoming sprint. A Scrum Team also uses this opportunity to look over their Definition of Done, to make it more transparent and stringent with respect to what the Scrum Team means when it says that the Increment of the product is “Done”, usable and potentially releasable. Every member silently pens down the answers to above questions. Then they discuss about each. They agree to what are the most important improvement areas and actionable improvements. The Scrum Master usually facilitates the discussion and encourages the team to focus on improvements. What the team is glad about in the Sprint. What things make the team sad. To conclude, Sprint Retrospective is an important inspect and adapt opportunity for the Scrum Team to embrace continuous improvement in a complex environment. Here, they focus and identify what the Scrum Team can do different in the upcoming Sprint to make it more enjoyable, engaging and effective.